Biomes O Plenty is a beautiful mod. It adds so much to Minecraft, both in aesthetics and functions. It's also a horrible tease. The Coniferous Forest is one of my favorite biomes for a multitude of reasons, but primary among them is the fir trees. These huge trees have a distinct shape. But creating a home in this biome would require chopping a whole lot of them down. You might think you could just replant them, both as 1x1 trees and the distinctive '+' shaped trunks, but you'd be wrong. 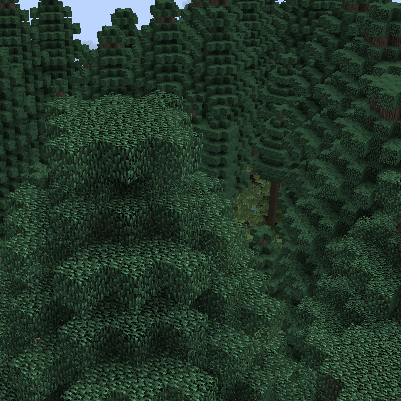 Fir trees don't grow to their full, large size from saplings in 1.7.10, no matter how you plant them. They only appear that way during world generation. This coremod uses ASM to modify the behavior of Biomes O Plenty fir sapling growth. If you plant a sapling on its own, it will grow its small variety as expected. However, if you plant five saplings in a horizontal "+" pattern, they will grow into a massive tree that you can normally only find in a Coniferous Forest! Brilliant! Normal lonesome saplings also have a small chance to grow into a tall 1x1 variety that also occasionally appears in the Coniferous Forest. The odds are somewhere around 1 in 10. This mod does not make any permanent changes to the Biomes O Plenty mod. Using ASM, it simply modifies sapling growth behavior at runtime. If you run into trouble with Biomes O Plenty (even if it's not related to sapling growth), make sure you Uninstall BoPTweaks BEFORE you contact the Biomes O Plenty team for support! Minecraft Forge version 1.7.10; confirmed to work with build 1614; other builds may also be compatible. This mod is provided without any expectation of support or assumption of liability. I'm not responsible if it blows up your computer or kills your dog. If you have ideas or suggestions to make it better, feel free to leave a comment. Sure! Go crazy. You can include this in public or private modpacks and redistribute it as long as you provide credit and link back to this page in some fashion. It'd be great to be able to grow some of the other ungrowable shapes of trees BoP biomes have in the future, too! Welcome back! Bayou willow would be great to be able to grow, yeah! I believe there are also willow-shaped dying trees you can find in Silkglades! That'd be really cool - I understand if it might be more difficult though! Great idea! thanks for making this!